Sea bass is always at the top of our catch it wish list when we head out Kayak Fishing and if the sea gods deliver the fore family are pleased as punch. This sea bass recipe is one of our favourites as it ticks all the taste bud tingling boxes; it’s fresh, it’s cooked over fire and it’s full of flavour. Triple win. Although this beautiful fish is one of the nations favourites, Sea bass stocks have faced a decline in recent years and there are strict guidelines for recreational fishermen to protect the fish, between 1st January to 30th June bass are on catch and release only and from the 1st July to 31st December you can only catch 1 per fishermen per day in line with the government size limits. From our experience the best time of year to try kayak fishing to catch sea bass is between 1st July and September at dawn and dusk. These beauties in this recipe were caught by commercial fishermen from our hometown in Swanage in Dorset as the rules that apply to them are different than recreational fishing. For all the latest details and regulations head over to the Bass fishing guidelines on the Government website. If you’re buying your sea bass from the fishmonger ask them to gut it. To protect the flesh from the fire you can either wrap it in foil or bacon, we like to use seaweed which also adds flavour. You can use charcoal, wood or a gas bbq, slash the fish on both sides of the body to let the flavour permeate, here we used wild garlic butter on the flesh and in the cavity but you could rub the fish with oil, salt and lemon or any other marinade of your choice. Cook for approximately 7 minutes on each side depending on the size of your fish or when the flesh comes away easily from the bone. We served our bass with a wild salad, you can add all sorts of spring greens from Jack by the hedge, wild garlic, navel wort, sorrel, hawthorn leaves and so many more. 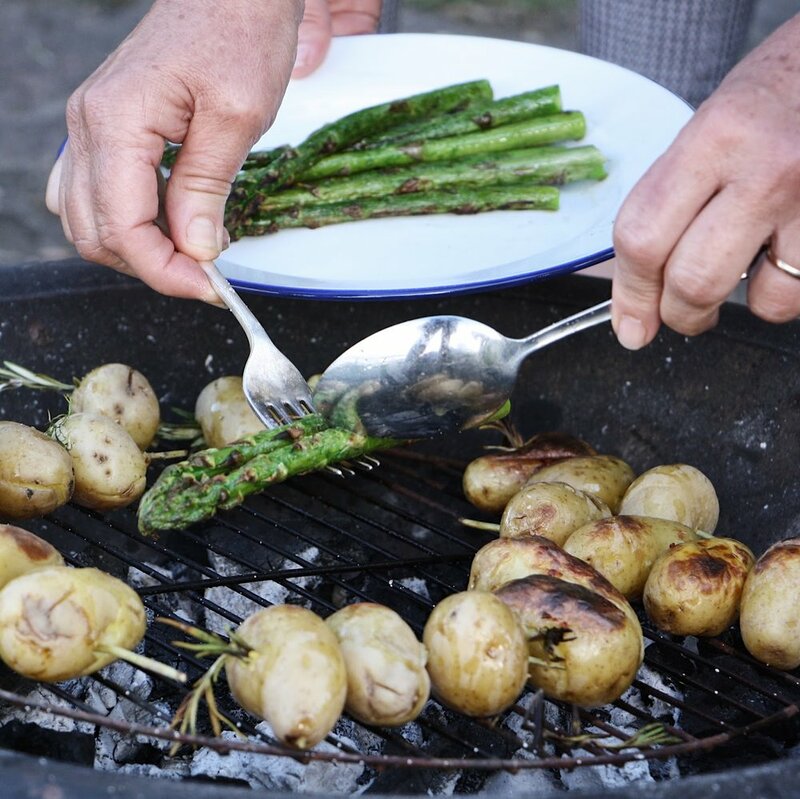 To accompany your feast pre-boil some new potatoes and then thread on rosemary sticks before adding to the bbq to warm and add a smokey herb flavour. We dished up the bass with our wild salsa verde which can be found along with our other wild recipes and foraging guides on the blog. If you fancy trying your luck at catching your supper, we run regular kayak fishing courses in Dorset where we teach you the skills required to fish from your kayak, with a safety briefing and introduction to the equipment and kayaks, followed by a trip to the best kayak fishing locations in Studland. We also run kayak, fish, forage & feast events where you get to cook up your catch back on the beach with us.